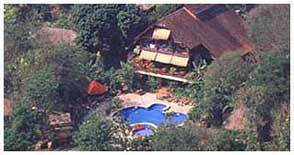 The River Kwai Resotel provides comfort accommodation in your privacy amids lush garden beside the Kwai Noi river. It is located 60 km west of Kanchanaburi town. Surrounded by the mountains and forests the resort style accommodation gives you the perfect relaxation. Thatch-roofed Thai cottages and chalets are all fitted with air-conditioner, private bathroom with hot and cold showers, satellite TV. The resort has a swimming pool, restaurant and seminar room. Phone and fax services are available at information center. 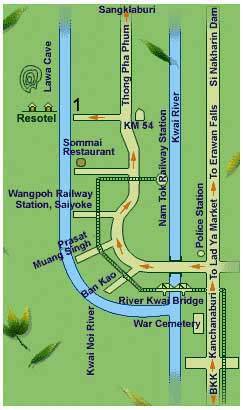 Located on the bank of the river Kwai Noi in Saiyoke district, Kanchanaburi province, about 200 kilometers from Bangkok. By car drive along route no. 323 (Bangkok - Kanchanaburi - Sai Yoke - Thong Pha Phum). Turn left at km. marker 54 for another 2 km drive to the Resotel parking lot and pier. By bus take a bus at Bangkok's southern bus terminal to Kanchanaburi. Then change to Thong Pha Phum bus and get off at km. marker 54. By train take the morning train at Bangkoknoi station in Thonburi (on the western side of Chao Phara river in Bangkok). Get off at Nam Tok station and find a local transport or ask the Resotel to provide free mini bus transfer when booking. The meeting time at Nam Tok station shall be between 1300 - 1330Hrs.